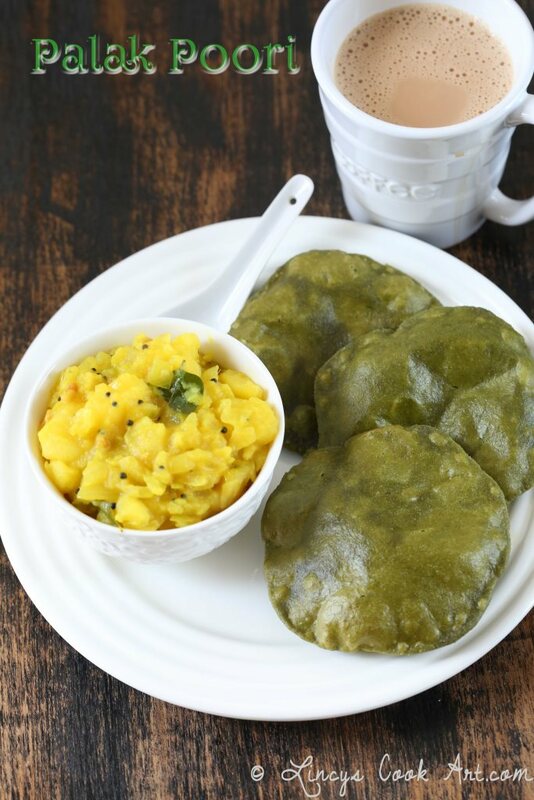 Palak Poori| Spinach Poori is a healthy twist to the normal pooris. The Poori is a deep fried flat bread served for breakfast. Adding vegetable makes the food little healthy and makes the food more colourful and attractive. The green colour goes well with the yellow Potato masala served with pooris. 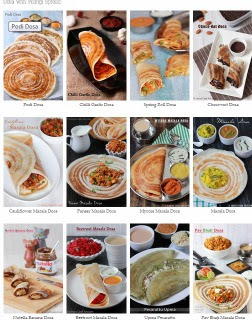 Check my other Healthy Palak recipes, Palak Paratha recipe which is a healthier version, Palak Dosa, Palak Paneer Dosa, Palak Dal, Palak Chutney..etc. To check the health benefits of Spinach refer Palak Chutney recipe. In a mixing bowl add the semolina and drizzle little water to soak it up for 5 minutes. Drain the water if any stagnating on top after 5 minutes. Wash and finely chop the spinach. Keep inside a blender jar and grind to make a fine paste with out adding any water. Add the whole wheat flour, oil, ajwain, salt, the ground spinach puree and mix well with hand. Knead well to make a dough. As the dough should be soft enough, so add enough spinach puree to make it soft and pliable dough. If the dough is hard, while frying cracks will form and it would taste dry, also the pooris would not be soft. Divide the dough into six to eight small balls. Grease it with oil to avoid cracks on the surface. Spread the pooris by adding very little flour and spread to make palm sized pooris using the rolling pin. Heat oil in a deep pan and fry the pooris on medium flame by carefully sliding the pooris inside the oil. Once the pooris try to pop up from the oil slightly press the poori downwards using a slotted spoon to make the poori to puff up completely. Flip the pooris and cook the other side too and drain from oil and keep on top kitchen towel to drain excess oil. Serve hot with Potato masala/ Channa Masala. Notes: You could flavour the pooris with ajwain. You could add two green chillies with a piece of ginger while grinding the spinach if you wish. To make perfect pooris refer my Poori post for extra tips to make a perfectly puffed up pooris. I have added extra 1/2 tablespoon of semolina for this poori to prevent the pooris getting soft due to the addition of spinach puree. Healthy spinach puris.. Looks perfect and delicious with potato masala..